China's Smartphone Market: Maturing or Not? 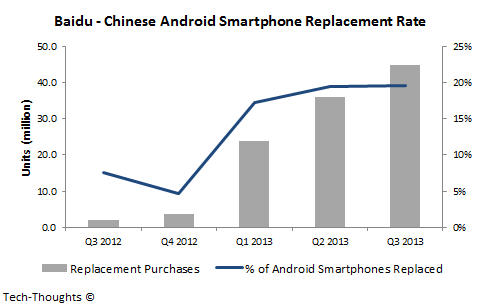 Data on the Chinese smartphone market is extremely hard to come by. So when Baidu releases a report with install base and sales figures on Chinese Android smartphones, Google translate becomes every analyst's best friend. 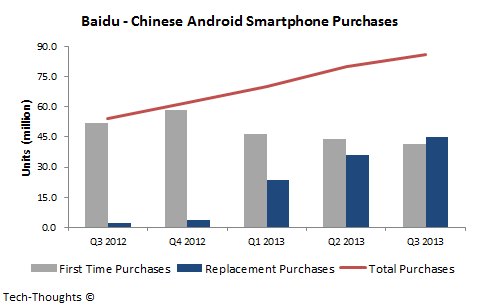 The chart above shows that Android smartphones have seen linear, QoQ growth in sales over the past one year. However, the split of smartphone purchases between first time and replacement buyers seems to show a rapidly maturing market. Over the last year, replacement purchases have grown from about 5% to more than 50% of all Android smartphone sales. The proportion of Android smartphones replaced (out of the active install base) every quarter has seen rapid growth and topped out at ~20%. Interestingly, the implied replacement cycle of 15 months seems quite narrow and suggests that the install base is still mostly comprised of devices with limited lifespans. This suggests that a massive volume of low-mid range Android device owners will be looking to replace their devices in the coming year. It's no wonder Xiaomi's prospects look so bright.